Learning to recognize your parrot’s healthy body language will help you know when he is feeling fine or when he’s ill, as well as when he wants attention or food. It will also help you avoid receiving a nasty bite. Most parrots are an open book in terms of body language. Once you know the signs, it’s not difficult to tell when your bird is happy, sleepy, terrified, or simply excited just by noticing his stance. Flapping wings: Clipped parrots will often hang on to a perch, the side of the cage, or a dowel on a playgym and flap, flap, flap away. Flapping is exercise for your companion parrot and can indicate that he needs a little more activity or wants your attention. Crest position: Cockatoos, cockatiels, and hawkheaded parrots have a wonderful way of showing you how they feel: a head crest (shown in Figure 1). When the crest is mostly back, with just the tip of it sticking up, the bird is generally going about her business, content and relaxed. When you’re playing with her, she may lift her crest, excited by playtime or something new and interesting. If the crest is standing high at attention, it’s an indication of excitement or fear. An absolutely terrified cockatoo or cockatiel will slick her crest down flat and may also crouch and hiss. Figure 1: For cockatoos, cockatiels, and hawkheaded parrots, raising the head crest can mean excitement, fear, and joy, among other things. Fluffing and ruffling: Parrots will perform a quick feather ruffle to release tension, much like when humans take a quick moment to lean back and stretch before we go on to the next task. Parrots also fluff their feathers after a preening session so that all of the particles of dirt they have just removed will fall away. You may notice a fine dust of powder emanating from your bird after he does this, especially if you have a grey, a cockatoo, or a cockatiel. A parrot that stays fluffed for a longer period of time may be chilled or not feeling well. The “please” dance: A parrot that wants attention will clamber around the cage near the door and may sit right in front of the door, moving his head back and forth. This means he wants out. If he does the please dance while he’s out, he wants your attention or something you have. Head down: If your bird is used to being scratched on the head or neck, she may put her head down and ruffle her feathers, giving you the perfect spot to scratch. The attack stance: Displays of aggression can be normal at times for a companion parrot, though they can be unpleasant. Many aggressive displays are merely posturing. A bird would much rather fly from a fight than actually engage in one, unless it’s defending its nest. Unfortunately for the companion parrot, there is often no place to escape, and the aggression must be acted upon. Aggressive postures include fanning of the tail; crouching or standing tall and swaying from side to side with the crest held tightly back; hissing and spitting; fluffing the back feathers; and crouching with the beak open, ready to pounce and bite (as shown in Figure 2). Figure 2: This African grey is in “attack” stance. Avoid putting your fingers in his face at this time. Stretching: Parrots stretch for the same reasons people do, to lubricate our joints, to release tension, and primarily because stretching feels good. You may notice your parrot stretching one wing and one leg on the same side of his body at the same time. This classic birdy stretch that resembles something from yoga called mantling. Bowing and bobbing: Bowing and bobbing is an attention-getting technique used by tame parrots. It can become a neurotic behavior for a constantly caged parrot. Also, ill parrots bow and bob, so you’ll have to watch your bird carefully to distinguish an attention-getting strategy from illness. Head shaking: Some parrots, particularly African greys, shake their heads as if there’s water in the ears. No one really knows why they do this, and it seems to be normal. If your bird is doing this a lot, it may be a sign of an ear or nasal infection. Leaning forward, wings shaking: If the wings are quivering, and the bird is staring at you, it’s about to launch itself at you. This is typical “I’m going to fly!” posture. Quivering wings: A parrot that’s shivering or has quivering wings may be frightened, overly excited, or in breeding mode. Beak language: An open beak, crouched posture, and hissing or yelling is prime biting posture. 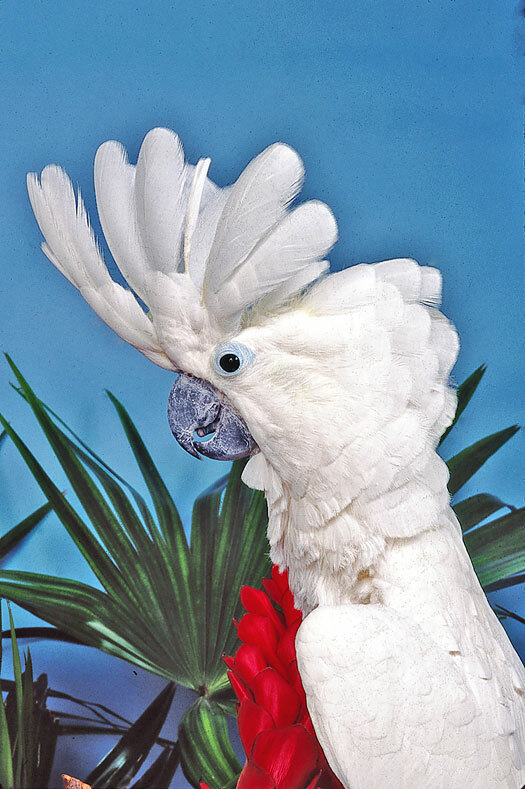 This is a frightened or displaying parrot. Potty language: Backing up a step or two or crouching on the perch, lifting tail, and even making a little noise. You can catch “poop posture” before the poop happens and move the parrot to another place if you want him to poop elsewhere. 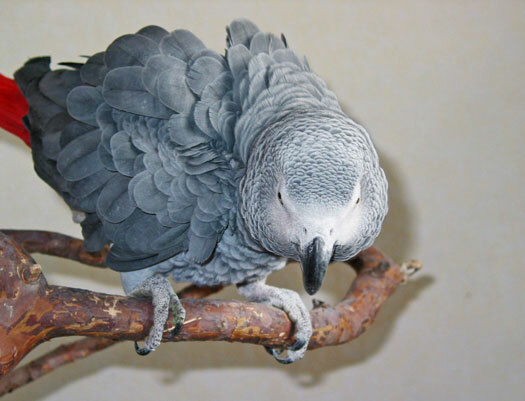 Chicken scratching: African greys and sometimes other parrots will “chicken scratch” at the bottom of their cage or on the carpet. Greys in particular do this because digging is part of their natural wild behavior. If you don’t mind the mess, you can give your grey a sandbox (or litter box) to play in, using clean sand from the toy store. Eye pinning (dilate/contract pupils): A parrot whose pupils are pinning in and out is excited and may be in bite mode. Some parrots do this when they’re excited about something they like, such as a new toy or good food. Wing drooping: Wing drooping can be part of a mating dance, but in a listless bird, it can indicate illness. Wing flipping: A parrot will flip its wings up and down to indicate frustration, get attention, or indicate aggression. It may also happen during molting, when it’s trying to align new feathers or get rid of old ones that may be hanging or ready to fall out. Blushing: Some parrots blush — the blue and gold and the Buffon’s macaws, for example. It’s not for the same reason that humans blush, however. It’s more about excitement and mating ritual. Back down, feet up: Some parrots play on their backs. If the bird isn’t breathing and is stiff . . . well, get the shoebox ready.